On May 10, over 1000 Hazara-Australians converged on Canberra from across the country to protest the recent wave of killing of Hazaras in Quetta, Pakistan and the Australian government’s failure to publicly condemn the killings. 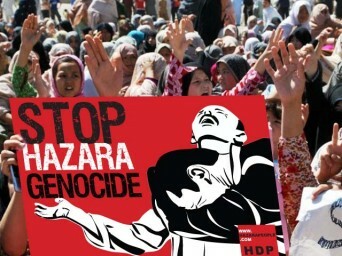 Over 700 Hazara civilians have been killed in and around Quetta in the last ten years. But the killings are escalating, with 150 killed in the last two months. Hazaras are Shia Muslims while Afghanistan and Pakistan are predominately Sunni Muslim. Sunni extremist groups like Lashkar-e-Jhangvi (LeJ) and Sipa-e-Sahaba Pakistan (SSP), that issued a fatwa against Shia Muslims in 2004, have claimed responsibility for many of the attacks. But while the Pakistani government ostensibly bans such organisations, not a single person has been charged. It’s obvious that they receive tacit support and protection from elements of the Pakistani establishment. Laurie Ferguson, Labor MP for Werriwa in Sydney’s Western suburbs, addressed the protest. While he was cheered for saying he would bring the “reign of terror conducted against Hazaras” to the attention of Foreign Minister Bob Carr (mind you, Carr had been invited to speak), Ferguson was silent about the abuses of the Gillard government which has demonised their arrival by boat, incarcerating thousands in detention centres and now threatens to deport them. Two years ago the Labor Government suspended the processing of Afghan asylum seekers, and in 2011 it signed a Memorandum of Understanding with Afghanistan’s Karzai government to allow forcible deportations of “failed” Afghan asylum seekers. But contrary to Australian government claims, the situation for Hazaras in Afghanistan hasn’t improved, and in Pakistan has deteriorated sharply. In December 2011, over 100 mostly Hazaras were killed when a suicide bomber struck Shia mosques in Kabul and Mazar-e Sharif. A pending High Court decision will soon determine whether the government can deport asylum seekers deemed to be “out of process”, including Ismail Mirza Jan, who the government moved to deport in November last year. Last September, the government did deport Afghan asylum seeker Mohammed Ashraf to Quetta the day after his father was killed and five months after his son was shot and wounded in the Quetta cemetery. If the High Court goes in favour of the the government, many more face the same fate in the weeks ahead. With chants of “Stop, stop killing Hazaras” and “Hazara rights are human rights”, the protest moved to the United Nations Information Office, before ending outside the Pakistan Embassy—the site of a ten day sit-in leading up to the protest. The turnout in Canberra was an enormous success, but more action like this will be needed to force the Gillard government to provide Hazaras with the protection they need. Hazara contingents at the World Refugee Day rallies in June could help forge links between the Hazara community and the refugee campaign and send a strong message.